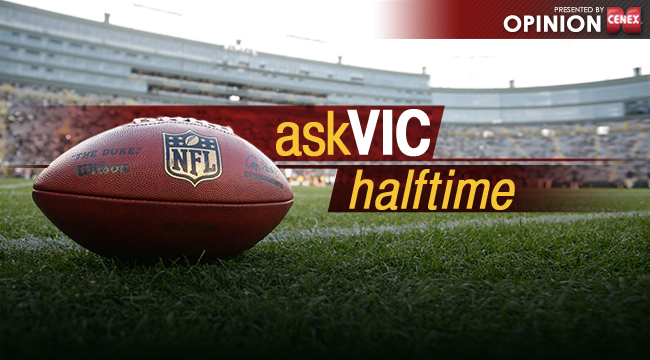 Vic, am I crazy or can I hear Seahawks fans on TV? What is your observation of the challenge you issued? I only see one Seahawks jersey. How does the offense change with Starks as the only healthy active running back in the second half? Lacy is questionable to return. If he doesn’t return, the Packers will have lost their hammer. It would be a significant loss. Vic, have you known other quarterbacks that take advantage of offsides as Aaron Rodgers does? Seattle looks confused. I think the Packers have game-planned very well for the Seahawks’ run game. This is Capers at his best. They did early – I saw some gap-control stuff – but eventually the novelty of schemes wear off and you have to win your one-on-ones. I can feel the Seahawks asserting themselves. We’ve got a long way to go. Vic, did we successfully keep our homefield advantage? How’s the noise? It’s Lambeau Field at its loudest. The fans are sensational tonight. Vic, how do the Seahawks understand what Pete Carroll is saying to them when he has that big wad of gum in his mouth? I was able to read his lips: Bad men take Jane. Vic, this defense is flying around and stopping the run. What’s going on down there? You’ll never see a Packers team more emotionally prepared to play a football game, but emotions will only take you so far, and eventually you have to win with the controlled execution of your craft. We’re nearing that point. The second half will be about execution. Vic, we’ve got ourselves a street fight. Already battered and bruised. Hoping for a good finish. I love the drama. As long as we have “The Man,” we have a chance. Guess what I have! A man named Chris just personally delivered a box of unbelievably delicious and piping hot giant pretzels. Just for me! He brought me some gourmet mustard, too. I just took a bite. It’s the most delicious giant pretzel I’ve ever tasted. They must sell these at the concession stand. I know the chance of injury is 100 percent in the NFL, but I watched a lot of the games today and today was ugly in terms of injuries. Hope our guys, and all, are OK.
It’s not good so far. Eddie Lacy and Davante Adams are each questionable to return due to ankle injuries, and Josh Boyd was carted from the middle of the field with an ankle injury that appears to be of a more serious variety. He’s out. These two teams are polar opposites. It’s perfect. What has made you say whoa in this game? The free-play, pass interference penalty at the end of the half. I thought it was a mistake to hurry from deep in Packers territory, but the penalty is a huge stroke of good fortune. It could be the game-changing play of the game.